Just like his sister, Callum our second-born decided to shake things up a little and make an early appearance. The funny thing about this pregnancy and delivery is that no matter how much I prepare myself mentally – i.e. prepping and expecting a natural delivery with epidural, being conscious of the signs of labour such as the bursting of water bag (and knowing the difference between that and leaking of pee) – the baby seems to have other ideas which call for a change in plans. Right from the start, I took for granted that this baby will be engaged in time for birth. Turns out, he got too comfortable being in the breech position that he stayed put right until the very last minute. With this, our gynae told us to prepare for a c-section delivery rather than natural birth – which made me quite upset, as I was hoping to experience the birthing process all over again. As he was a bit on the small side for his gestational age, we agreed to schedule the c-section on 39+3 weeks – as I wanted to give him more time to pack on the pounds. This little one apparently had plans of his own! At 37+6 weeks, i started spotting a little just as I was leaving the office for the day to pick up Crystabel and head for my gynae appointment. Was told to come down to the clinic as soon as I can, and the doctor did more tests on the little one and my water level (which was all fine), and to check if the cervix had started to open (it was still closed). With this, my gynae highly recommend that we push forward the c-section date to avoid the risk of an emergency c-section should labour start on its own naturally. From here, we decided to do the op a few days later on 38+3 weeks – and was given MC to rest from now till then. The spotting stopped after the appointment which put our minds at ease a little, but I noticed that it would return over the next few days – mostly during the evening. Good thing that we were both able to hold up until the day of the op. The day of our scheduled c-section came soon enough, and we made our way to Mt. Alvernia Hospital a little more than 2 hours before the actual op time to clear the check-in formalities and procedures. Once all was done, I got changed into the hospital gown and was then wheeled to the operating theatre to wait for my gynae and anesthetist to arrive. It was raining then so there were running a little late due to the traffic jam. But I didn’t have any ‘specific time’ on which baby must be out, so I was ok with waiting a bit – gives me time to prepare myself mentally. Hubby on the other hand was asked to change into scrubs and wait at another area, and will only come in once the doctors were ready for the op. Shortly after, the doctors arrived and got to work straight away. I was placed on the operating table and given epidural. For some reason, I felt that the epidural jab this time round felt more painful compared to when I had Crystabel a few years back. Maybe the labour pains were more intense back then, which made everything else pale in comparison. This was followed with a numbing sensation and the anesthetist told me that it had started to kick in. The gown was raised to cover up my tummy area and my gynae got to work straight away. And then, hubby also appeared next to me. As he was trying to talk to me, I felt nauseated which meant that the epidural effects had kicked in. Heard someone asking him to hold the dish tray for me to puke into – and a short while later he told me that baby is finally out. My gynae confirmed it by congratulating us, and I remember asking why is he not crying. Hubby said something about them clearing out the mucus, and then we heard the baby’s first cries. They were soft at first, but then it got stronger and fiercer. The baby was wrapped up and passed to us to hold and the anesthetist helped us to snap some photos together. I remember thinking that he seems smaller – are newborns supposed to be this small? A short while later hubby was asked to follow the nurse to the nursery where more checks were done – while the 2 doctors finished up with the op. Once everything was completed, I was wheeled to the recovery bay for observation before being wheeled back to the room. 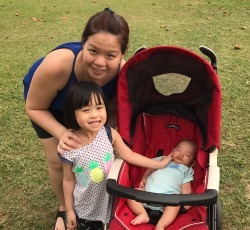 And with that, our journey of being parents to a newborn was restarted – and what we have experienced so far is so different compared to what we went through almost 5 years ago. Guess that’s why it’s often said that every pregnancy and delivery is different, and the same goes to every baby as well! Next Next post: ShopBack Review: Here’s Why Mummies Should Do Their Online Shopping with ShopBack!